I went into The Dark Unwinding without a lot of preconceived notions. I expected historical fiction with lots of steampunk, and I thought there was probably some sort of sweeping romance, of course. While all of those pieces were present, what I got was something slightly unexpected but still enjoyable. The Dark Unwinding tells the story of Katharine Tulman. She was raised by her aunt Alice, an awful woman who resented and despised her. All Katharine’s ever heard was vitriol and disappointment. This is part of the reason Alice sends her to Stranwyne Keep. Katharine is sent to witness her Uncle Tully’s “insanity” for herself, and she’s supposed to commit him so her cousin Fat Robert can add more to his inheritance. However, things aren’t quite what they seem at Stranwyne, and Katharine finds much more than she bargained for. This is fully Katharine’s true coming-of-age. She literally turns 18 within its pages, but this is more about finding her voice and discovering what her strengths are. For the first time in her life, Katharine has been given the chance to live free of her aunt’s orders, and she is able to find that she’s capable of so much more. The people of Stranwyne don’t immediately take to her, given that they know she’s there to potentially kick them out of their homes. The members of the household are especially wary to trust her, specifically her uncle’s assistant Lane Moreau, but all of that changes once she meets her Uncle Tully. He’s eccentric, for sure, but I thought he had such sweetness to him. His relationship with Katharine was one of my favorite aspects of the novel. To be honest, I expected there to be much more steampunkiness than there was. Uncle Tully is an inventor of miraculous automaton figures and animals made of clockwork, but I expected the inventions to take more of a main role than they did. Sure, they were definitely mentioned, and certain pieces played a bigger role in the larger plot, but I would have liked to see more for the devices. Also, a large part of The Dark Unwinding is Katharine’s confusion and belief that she too is going crazy like her uncle. She experiences bizarre dreams that turn out to be real and other out-of-nowhere occurrences. These instances felt very jarring to me, and it took many chapters before I was able to get a full grasp of what was happening. I understand the purpose of this- that the audience is supposed to feel the confusion right along with Katharine- but often it felt a little too jumpy. Overall, I thought the story was so original and full of unexpected turns, and I enjoyed Katharine’s journey to find her true voice. I’m extremely curious to know if there will be more to Katharine’s story, as Sharon Cameron leaves you on a bit of a cliffhanger. 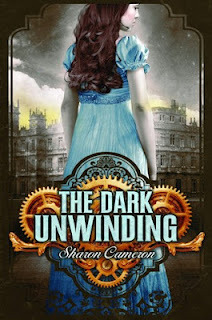 I think The Dark Unwinding would be a great read for anyone looking for historical fiction with a bit of a twist. I have to say, I'm looking forward to reading this when I can! Great review!